I’m going to explain one reason I bought my new house: I love trees! Oh, I also moved because it was a better location for me in my life right now, but there was this tree. I knew the place was special when I drove by, and then drove by again, and each time I passed, I really didn’t see a great-looking house, I saw “the” tree. The tree is a native cottonwood, over a hundred years old, and I hope it will continue to flourish. I am looking forward to making good memories under its shade, and am excited to see how it looks when the buds are liberated. 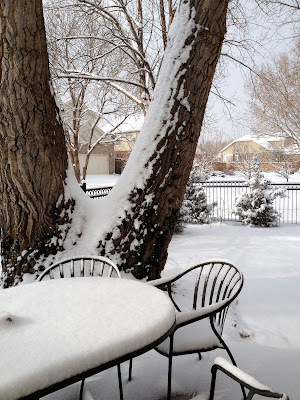 If you’ve been a faithful reader of my blog, you know this tree; I’ve shared it already in photos in my snowy pictures. It’s right outside my back door! I wish I had a photo of the tree I’m going to tell about next. It is so vivid in my memory. I lived with my maternal grandparents until I was five. My father was killed in action in World War Two, so mother and I moved in for a few years while she went to art school. She was not a great artist, but a good one, and loved art all her life. In my grandparent’s back yard was a maple tree. In that tree my grandfather hung a swing, just right for me, and I soon learned to climb the tree, too. It wasn’t huge, and had easy limbs to give a boost to a little girl. Well, the part I liked best was that there was a certain configuration of limbs that were just right for a pillow, and leaning back. I read up there! There aren’t many nicer things for a little girl than reading in a maple tree in the autumn, leaves blazing. There is a third tree that holds a special place in my memory. A long time ago, so long that the students with me are now grown, some with families, I traveled to the state of Sonora, Mexico with my class. We stayed on the ocean for a while, then drove deeper into the wilderness. I don’t think I’ll ever be on such an adventure, and probably will never see a boojum tree again. From my research I see that they do grow in the desert southwest, too, but this time, we were taken to the local village’s special tree. We sat and journaled, and we held a ceremony where each of us shared some of our precious water with the tree, ensuring long life for us all. 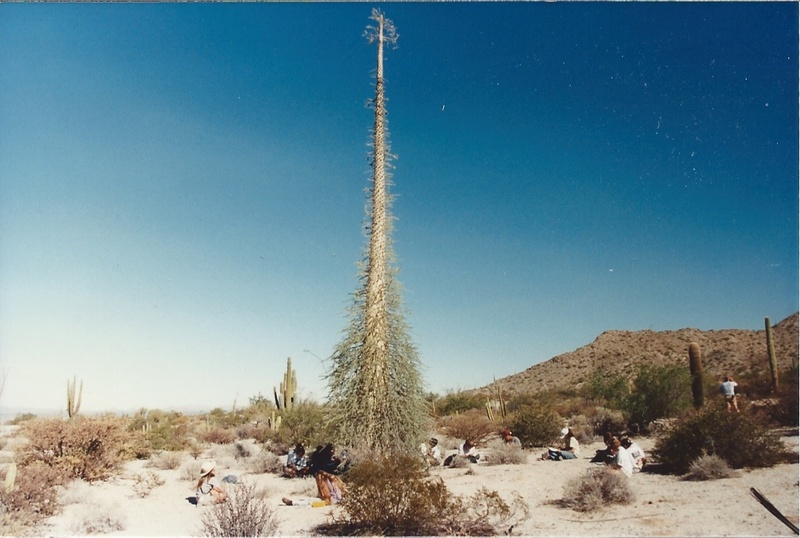 Yes, this next picture is of that boojum tree - Fouquieria columnaris, or candlewood. You can see some of the students sitting below it with their journals. It was a magical tree. Thank you for sharing these memories, Linda! I also loved to climb trees when I was a kid. We had three maple trees in front of our house, and I could get up those trees in seconds. I never read in them, but do have a vivid memory of reading Charlotte's Web under one of them. I hope your new home is everything you're hoping for! Thank you Catherine. I think if we asked, many of our students would have a memory of a favorite tree. I can't imagine 3 maples in a row-must have been gorgeous in the fall. I love trees, too. Reading your memories made special trees in my life come to mind too. Thanks for these memories! Thanks Deborah-as I said above, I imagine most of us have some memory or another. Your connecting of the trees of your life is just great. So many of my memories are also of trees, around trees, under trees....thank you for the reminder. Thanks Anita. 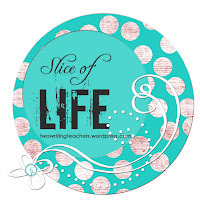 Perhaps I'll see some of you slicing about a memory? This is a nice post about the trees in your life. I hope the snow stops soon and you can enjoy the spring with your new tree-friend. The snow has stopped, now it just has to warm up to melt! My brother in MO just texted that it's there now! Thanks, Margaret! Beautiful post, Linda! That's a very interesting tree in your last photo. Not one I've seen before! We have three cherry blossom trees -- so stunning when they bloom. The fruit trees blossoming are wonderful, I agree. I will have fun seeing if there are any in the neighborhood. Thanks, Tabatha. I love the stories connected by trees. You took me back to the trees of my youth and beyond. I wondered if everyone doesn't have some special memory connected to trees. Will be good to hear! Thank you, Elle. Wow. What special trees. I also climbed a tree by our house to read when I was little. I wish there was such a tree at our house now for my boys. Trees are just so special - and I love that your new house has a perfect one for you. I think we are fortunate that the builders left the old trees. They could have just taken them all out. How great that you read in a tree too. Thanks, Katherine. Like you, my son had a special white birch tree in our front yard that he used to climb and sit in. It was sad when we had to cut it down years ago. I loved the stories of the special trees in your life. I have never seen a boojum tree. How unusual! And when I looked for more information about the boojum, I found they are very expensive to buy, grow very slowly. This one must be very old. Thanks Mardie. I reached into my own memory vault today, too, Linda. How vividly you capture the tree and your moments of sanctuary there. I know you have that old, oak I think, in your yard, and probably more in your area. Thanks, Tara. I always love your pictures. It's a nice peek into your memories. When I was growing up we had two Weeping Willow trees in our yard. One was huge and old and just right for settling in with a good book - yes I loved to read there too! The other was young and just right for climbing. It was the hangout place for the neighbor kids and I.
I love weeping willows. What a great memory you have too. It's such fun to hear everyone's memories, Robin. Thanks! As I read your tree memories, I pondered if I had any. Slowly a few surfaced and I may have to write about them too. I am envious of you resting in the branches and reading. We never had a tree that was climbable. Yes, your snow has make it to Missouri, soon it will travel to Indiana and Ohio. Sigh . . . love the moisture, but tired of snow. My brother (mid-Missouri) texted a pic of the storm this am. Yes, the moisture is welcome, but it is extra work. Sun is out today! I hope your trip is okay, Elsie! Look forward to you writing about your own tree memories. I spent a lot of time at creeks, too, when I visited an aunt on her farm. Such fun. I had never heard of boojums until this trip either. Fascinating, & they are deciduous! Thanks, Jennifer! Oh my- trees evoke some great memories, don't they? We have a huge chestnut that has grown from a sapling from my grandparents' yard. I really think you could write a picture book about the reading tree. I love how you share small but important parts of your life within your posts, Linda. Thank you for all the sharing and inspiration you have been to me. It seems to me from all I've heard today that everyone has a story to tell about trees. Thanks much for your sweet comment, & for the thought about the 'reading tree'. You have me interested! I've had favorite trees everywhere I've lived. My brother often phones me when he passes my favorite tree on the turnpike between our hometown and the city two hours away. I loved the redbuds in our front yard when I was growing up and the magnolia in our back yard in Houston. Today I love my Japanese maple, the tree outside my kitchen window, and a magnificent sequoia that I see on one of my favorite walks. Can't wait to hear future slices with this new tree in your life! You get to see a sequoia on your walk-how wonderful, Ramona. I am thrilled at all the stories that everyone has about a favorite tree. How neat that your brother calls when he passes your favorite tree! I hope you write about that one! What a lovely post, Linda. Loved reading about your special maple tree; I can just picture you up there reading and dreaming and making plans for the future :). That candlewood is amazing; oddest tree I've ever seen. Like that you and your students shared your water with it, too. This post made me try to remember a notable childhood tree -- it's probably the two lichee trees in my grandmother's side yard. My brother once climbed to the top in a braggy way and then fell! I still remember my Mom rushing home from work and how scared I was. He was fine, just winded, thankfully. Everyone has a tree memory & while yours is not exactly happy, it ended well, thank goodness. I've never seen a lichee tree so looked them up. The older ones look like great climbing trees! Thanks, Jama! A Final Post With Colorado Ties! 26 of 31 - What We Wrote In Class! 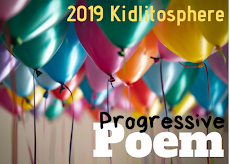 13 of 31 Madness Poetry today! Double Duty on Fridays-8 of 31/Poetry Friday!